So, this is a little strange. When it comes to Swiss cheese, I find it to be stinky with a horrible flavor, but when I add it to quiche? Magic happens! I don’t get it at all, but no one in my family would dream of biting down on a piece of Swiss cheese by itself. Yet, all of us LOVE this recipe. 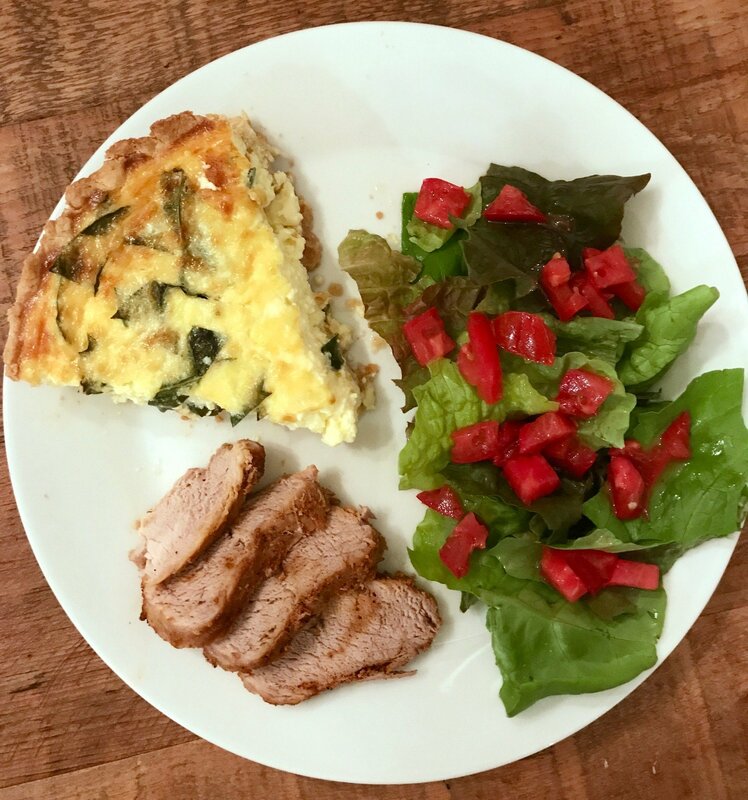 We loved trying ricotta cheese mixed into this quiche for the first time as well. Plus, I am all about a good way to use kale. You can hardly even taste it with everything else going on in this dish, so it’s definitely worth trying … even on your most reluctant eaters. 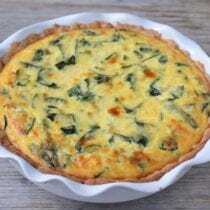 And if you prefer spinach over kale feel free to make that substitution and enjoy a delicious spinach quiche instead. Either way, good luck (and let me know how it goes)! 1 1/2 cups whole-wheat pastry flour, can sub regular whole-wheat flour, but I highly recommend pastry flour for this! In a 9-inch pie pan combine all of the crust ingredients with a fork. Use your hands to finish the mixture by pressing it into a ball. Press the dough into the pan and bring it up on the sides of the pan into one even layer. In a large bowl whisk together the eggs, cream and milk. Stir in the cheeses, kale, salt and pepper. Pour into the crust and bake until set in the middle and golden brown on top, about 40 to 45 minutes. 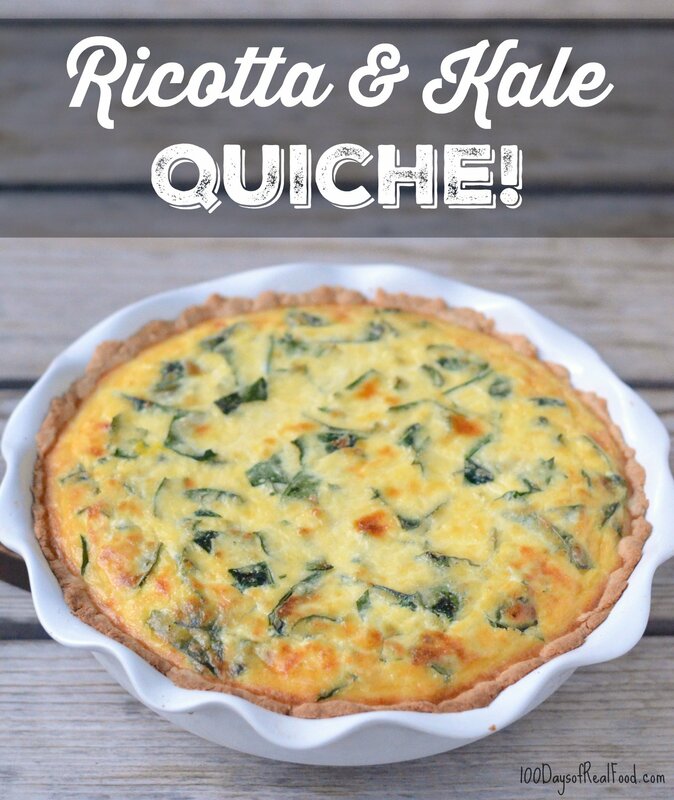 If you're positive kale won't be a hit, you can substitute spinach to make this a ricotta spinach quiche. When I saw the title, I thought, Hmm, they could probably do this with spinach. Which you indeed recommend. And which is a French quiche classic. Around here, “swiss” cheese is emmental, or gruyere, which are kind of basic cheese in the way that cheddar or american are in the U.S. I don’t find either to have a pronounced odor or flavor, though I find gruyere to be a little nuttier. There are entire aisles of supermarkets dedicated to emmental–that’s how basic/classic it is. Hey Lisa…! your ricotta looks amazing and soooo good. i will trying to making this recipe like you. Thanks for sharing…! Love this idea using kale since I am not exactly a fan of the kale dishes. Will do this version ! Thank you so much ! I made this quiche for the morning after Thanksgiving. I mixed all the ingredients the night before and poured it in the crust and baked it in the morning. It took at least a full hour for the middle to firm up. I substituted spinach and added some Canadian bacon pieces. Delish!! I had the same problem….it’s been cooking for an hour already and still isn’t set in the middle. Our neighborhood coffee shop makes a killer quiche lorraine, but I’ve never made quiche myself. I added some chopped cooked bacon, thinly sliced onions, and used spinach instead of kale. Everyone loved it! will definitely make again. I made this with spinach and added chopped Canadian bacon. It needed about 10 more minutes in the oven than the recipe states, and I let it sit for five minutes. The texture of the quiche is very smooth, almost like flan. Not quite what we expected but really good! I love that you make the pastry in the pie dish – quick and simple and yummy. We loved this recipe and will use the pastry base as a starter for all our home made quiches in future. I love this recipe and make it often. I’m wondering how I can make it ahead and freeze it to bake and serve later. I’d appreciate any advice! I know I’m late to the party but I used Swiss chard from our garden, goat cheese, and a sprinkling of Kerrygold cheddar. Divine! I don’t have swiss on hand but want to make this today. Can I substitute w/ cheddar, mozzarella, parmesan, or a mixture of those? Sorry. We can rarely answer recipe questions in real time. How did it turn out? I have been making this recipe for years. Kale and swiss by itself have very strong flavors that I don’t usually like alone. However, I LOVE THIS RECIPE! I usually make 2 and freeze one for later. Freezes very well. The crust is so easy to make right in the pan. I’ve left out ricotta before and it tastes just fine without it! THANK YOU!